The California State University Fullerton offers an online Masters program in Educational Technology. Participants in this program will complete 16 months or 30 semester units in a cohort-based model that actively engages and connects them with peers and instructors as they explore the how and why of using technology in ways to engage promote student-centered learning. The Masters program in Educational Technology at California State University, Fullerton successfully underwent the International Society for Technology in Education (ISTE) Seal of Alignment review for Proficiency. Reviewers determined that this resource provides substantial opportunities for participating teachers to practice the skills and knowledge necessary to meet the ISTE Standards for Coaches. This 16-month program offers offer a high-quality, sequenced, and interactive online learning experience. Students who complete this program are exposed to both the theory and practice of using technology in student-centered ways and are prepared to become technology leaders and advocates. 1.b. Contribute to the planning, development, communication, implementation, and evaluation of technology-infused strategic plans at the district and school levels. 1.c. Advocate for policies, procedures, programs, and funding strategies to support implementation of the shared vision represented in the school and district technology plans and guidelines. 1.d. Implement strategies for initiating and sustaining technology innovations and manage the change process in schools and classrooms. 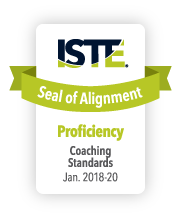 This resource offers a flexible implementation plan and opportunities to practice the skills and knowledge necessary to meet the ISTE Standards for Coaches.